If you are looking for a Raspberry Pi project to keep you busy this weekend you may be interested in this awesome Raspberry Pi Security System which has been created by Max Williams and is equipped with a motion detector and camera. 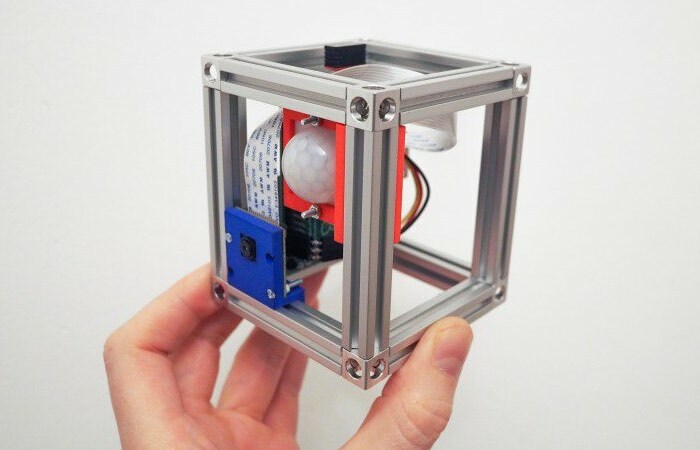 The Raspberry Pi security system has been built using a Raspberry Pi 1 Model A+ and the older Raspberry Pi camera module together with a generic PIR motion sensor and all enclosed in a Makerbeam cube. – Capturing all packets on a Wi-Fi interface is too resource intensive. – There are presently no good 5Ghz USB Wi-Fi adapters that support monitor mode. This means packet monitoring is restricted to 2.4Ghz where most modern mobile phones use 5Ghz now. – Mobile phones are not always online and sending packets over Wi-Fi. Sometimes they stay unconnected for 15 minutes or longer. – Even with 99% accuracy false alarms are annoying. After much testing I used an approach that mixes active (ARP scan) and passive (packet capture) detection over the Wi-Fi adapter based on knowing the MAC addresses of the mobile phones. The mobile phone MAC addresses are set in the configuration and the rpi-security application captures packets on a monitor mode interface with the following filter: 1. Wi-Fi probe requests from any of the configured MACs. 2. Any packets sent from the configured MACs to the host running rpi-security. Full instructions are available over at the hackster.io website via the link below to help you create your very own DIY Raspberry Pi security system. If you found this article interesting you might also be interested in this list of awesome Raspberry Pi Zero projects we have put together.